The Gap: Selected Abstract Art from Belgium curated by Luc Tuymans. 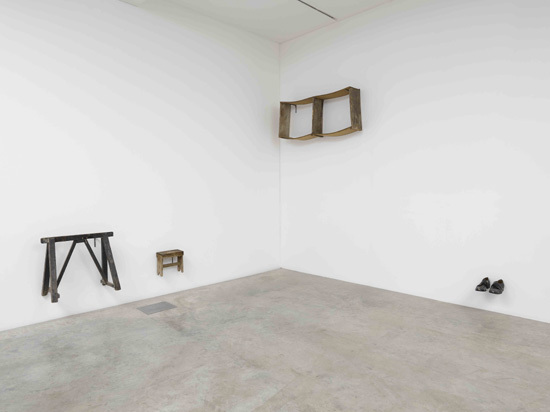 Installation view at Parasol unit, 2015. Photograph: Jack Hems. Courtesy of Parasol unit foundation for contemporary art. Featuring around 40 works from fifteen artists, The Gap: Selected Abstract Art from Belgium is an exploration of the notion of abstraction across a broad spectrum of interpretations. Currently showing from now until the beginning of December at Parasol unit foundation for contemporary art in London, the exhibition is curated by Belgium artist Luc Tuymans and seeks to follow the thread of abstraction through different generations and mediums, drawing attention to the influences which more contemporary artists carry from their predecessors while also exploring the diversity of artist practice and approach surrounding abstraction. There is an element of the exhibition which makes much of the work feel like a sort of refresher class in contemporary Belgian art history, recalling influences like Dutch painter Piet Mondrian and famous art groups like De Stijl and the Zero movement, while also touching on American influences from the mid 20th century. It’s the kind of group show which could easily run the risk of feeling like a school field trip, a demonstration of the way basic concepts of colour, shape and space can be developed and re-worked across the span of decades. And to be fair, in some ways, the show does suffer somewhat from its narrow curatorial brief, both in terms of the focus on abstraction (broad though that ultimately could be) and in its regional focus. In actual fact, there are two strikingly noticeable elements of the show which inject it with a sense of variety and innovation. The first of these is the way that the sculptural elements of the show help change the focus somewhat by casting the work across the walls and into the space of the gallery. In this respect, Gert Robijns’ four pieces here feel crucial. His piece ‘RESETHOME Ile Flottante’ (‘floating island’) is part of a larger body of work that the artist has undertaken over the last couple of years which at one point involved collaboration with Tuymans. Here, removed from the larger context of the project, Robijns’ work adds a sharp break in the exhibition by introducing the familiar objects of a pair of shoes, a trestle and a step into the exhibition space. Around the corner, another work entitled ‘Jeun‘homme,’ an overcoat protruding from the wall supported on metal beams evokes Beuys, adding a touch of the absurd to the field of abstraction. 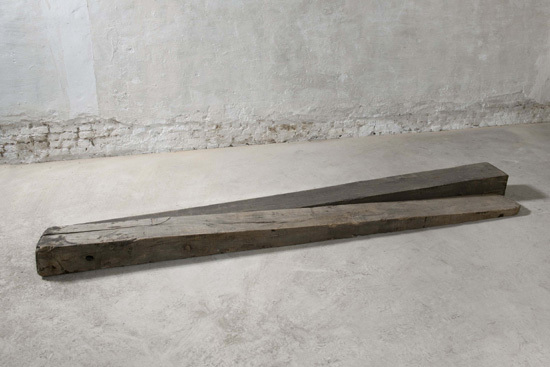 Near the entrance on the same floor, Bernd Lohaus’ untitled works, featuring beams of wood cut to mirror each other on the floor, and a piece of wood with coiled rope also help to elevate the exhibition from a collection of flat surfaces into broader territories. The work with the rope in particular is gorgeously evocative, and also highlights medium and material as much as concept. In the same spirit, Guy Mees’ pieces in the upstairs gallery space achieve a similar feat. The two circular constructions of lace and neon lighting replicate the lines and patterns evident elsewhere in the exhibition, but also broaden the scope of medium and approach while still retaining the minimalist strength of many of the other works. In the small room off to the side of the ground floor space is Boy & Erik Stapperts’ work ‘Sit-In Black Space,’ an immersive sculptural installation featuring two black polyester pieces in a pitch black room. It’s another strong move to take the work off the wall and situate it in space, and it serves perhaps the most all encompassing expression of abstraction, literally infiltrating every sense. Alongside these sculptural highlights, what also stands out particularly strongly is the strength of Tuymans’ curation throughout the show. Of the specific features which help join the two levels of the gallery space is the inclusion of Carla Arocha & Stephane Schraenen’s ‘Column,’ which runs up the column in the centre of the gallery on both levels. 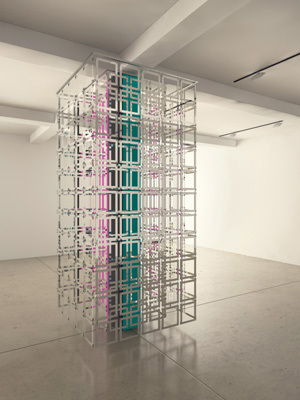 The geometric assemblage constructed from acrylic, stainless steel and plexiglass is another strong sculptural piece which takes abstraction into the wider spatial realm. The reflective material creates a shimmering illusion, catching both the viewer and parts of the surrounding space in its mirrored gaze. On the whole, the show feels perhaps just a little too neat to thoroughly engage the viewer past a certain point. Perhaps staying too true to its subject matter has rendered the exhibition feeling slightly (and perhaps ironically) one dimensional. While Tuymans has certainly amassed a solid selection of artists, and the installation of the work itself across both levels is almost faultless, there are limited opportunities to really build upon the work once you are outside. While the subtleties of the pieces within a Belgian context are certainly worth exploring, it’s difficult not feel that a less regional approach would have resulted in a much broader and more memorable exhibition of work, and consequently lend itself to a greater and more satisfying series of discussions after the fact.